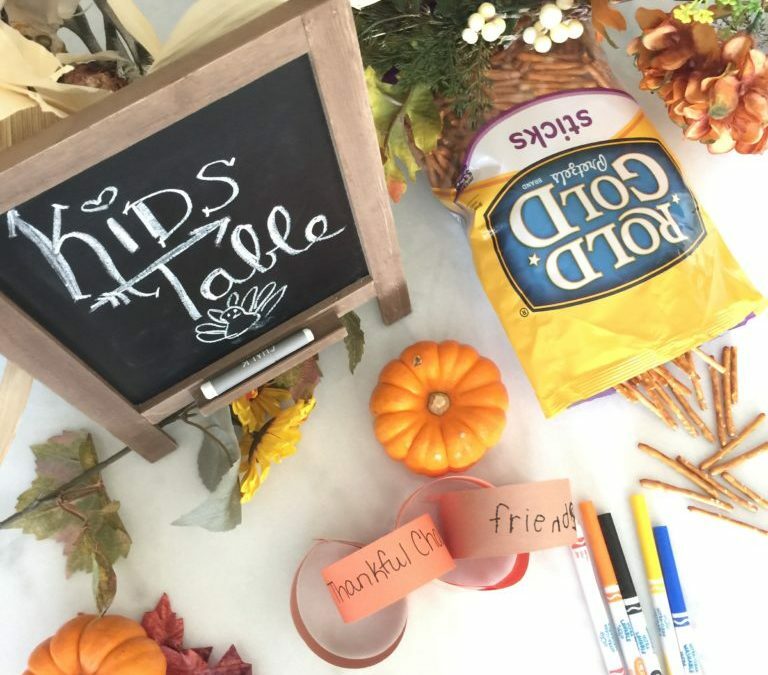 Create a kid-friendly table anywhere you go for Thanksgiving with a few supplies! Friends! I can’t believe Thanksgiving is here! It has creeped up on me like a drunk turkey. In order for everyone to enjoy Thanksgiving, we know the kid’s must be happy, right? I won’t be hosting Thanksgiving so I created some things that are easily transferred to someone else’s house. You may be going to a friend’s house that doesn’t have kids or your grandparent’s house that has glass figurines everywhere. (YIKES!) Get some crafts and kid-friendly eats at a table for the kid’s entertainment, so you can get a chat in with relatives! On second thought, some of us might actually prefer the kid’s table this year due to the elephant in the dining rooms..cough…cough…politics! 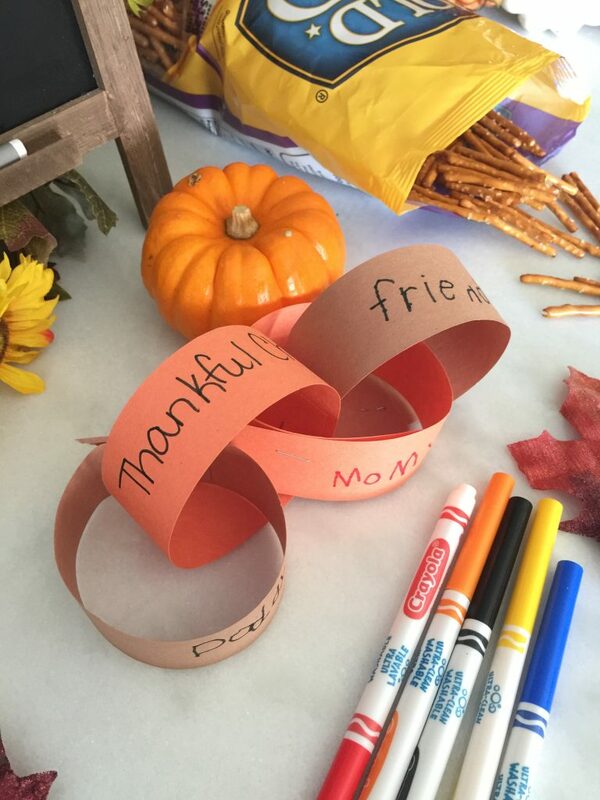 Thankful Chains – cut strips of construction paper and have the kids write things they are thankful for on them. (Some will need help!) When they are done writing, use a stapler to link all the strips together. Have the kid’s tell you where they want to hang it! Thankful Leaves – Many art/craft stores had leaf shaped paper available. 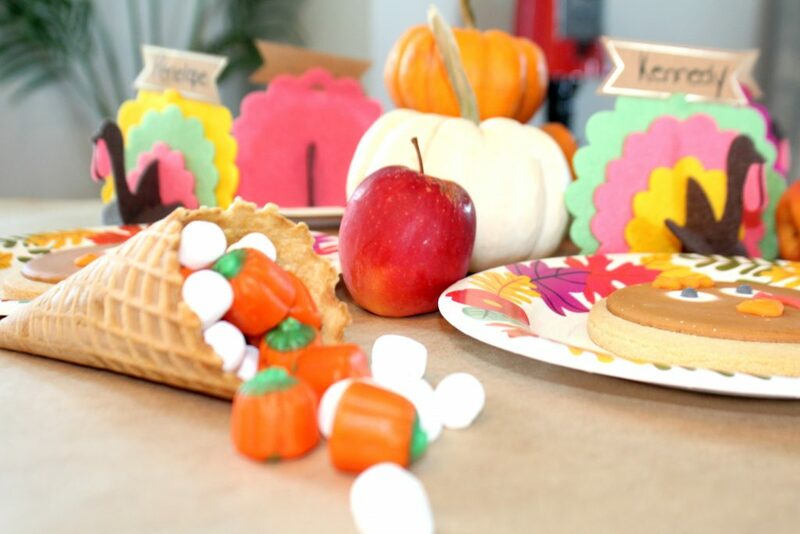 Provide markers for the kids to write things they are thankful for on them. On construction paper, draw a tree trunk and have the kids glue their leaves on top to create a “thankful tree”. Activity table covers – I found a few table clothes that had activities on them for the kids. 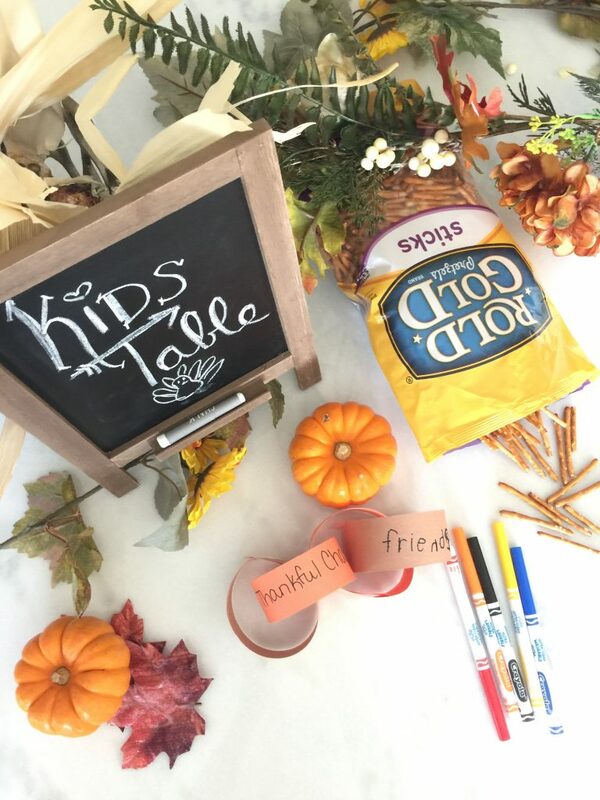 You can also use butcher paper as a table cover and provide markers for the kids to freestyle some art and/or games. 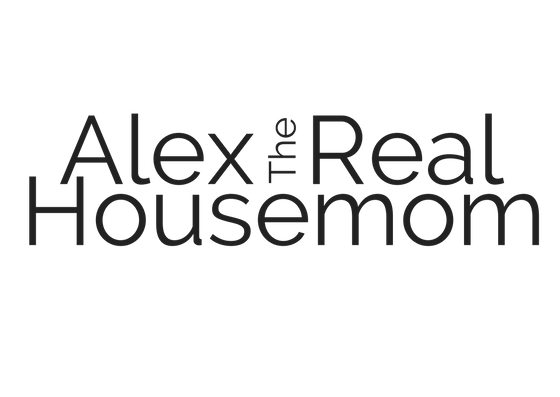 Kid friendly foods for them to snack on throughout the day that won’t go bad: Popcorn, pretzel sticks, goldfish, chex mix, veggie straws, etc. Fruit cornucopia – Buy waffle cones and make a fruit salad. 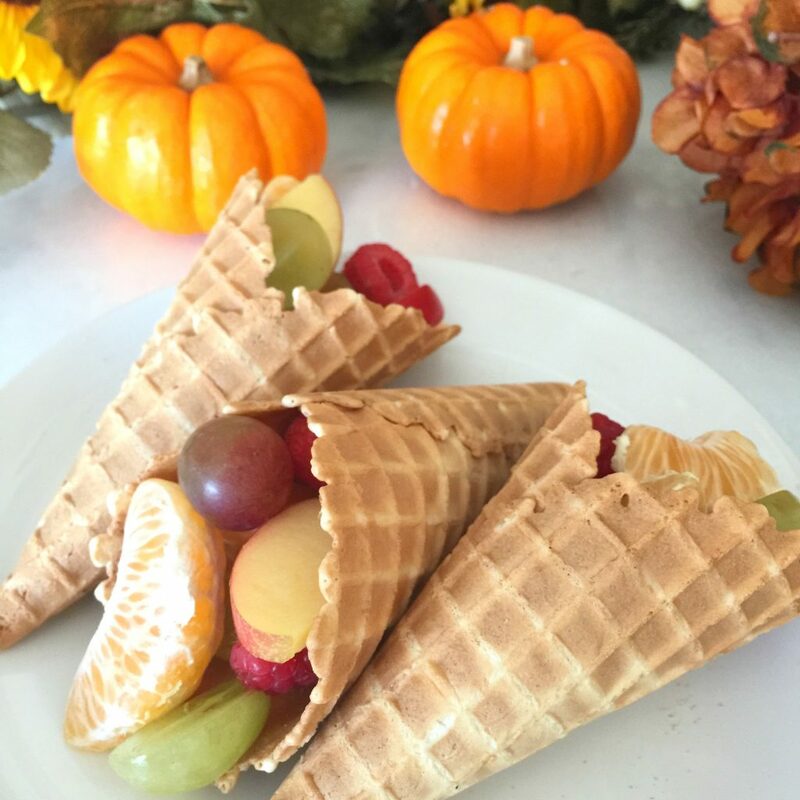 Have the kids spoon some fruit salad into their own waffle cones to create “fruit cornucopias”. 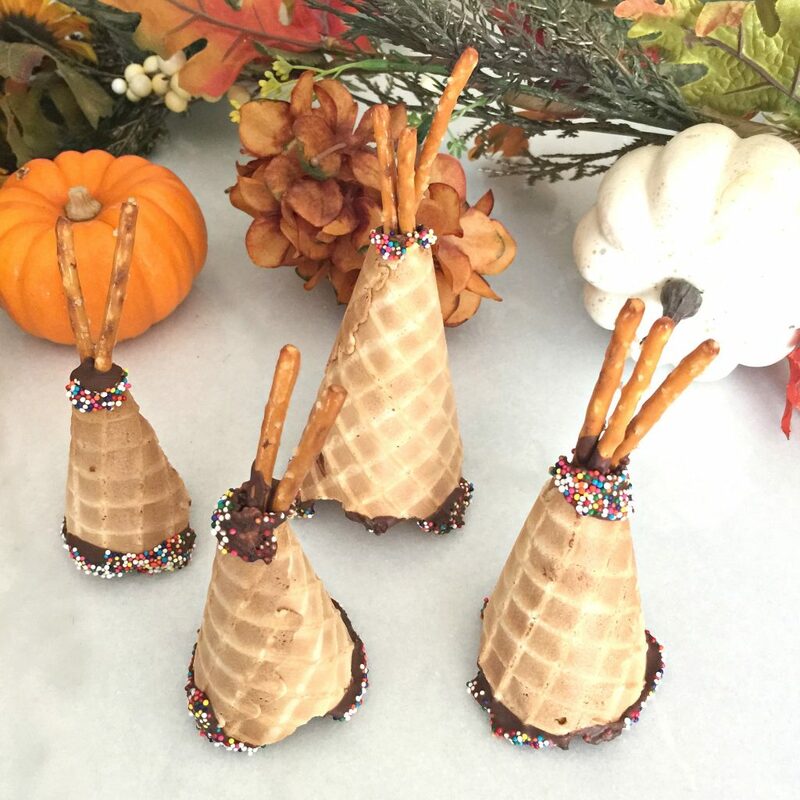 Waffle Cone TeePees – Break the tip off the bottom of each waffle cone to make a hole. Dip the top and bottom of a waffle cone into melted chocolate, then immediately into a bowl of sprinkles. Stick 2-3 pretzel sticks into the hole you created. Place cone tee-pees onto a flat surface until chocolate is hard. Turkey Cups – Buy clear plastic cups and the stick-on googly eyes. 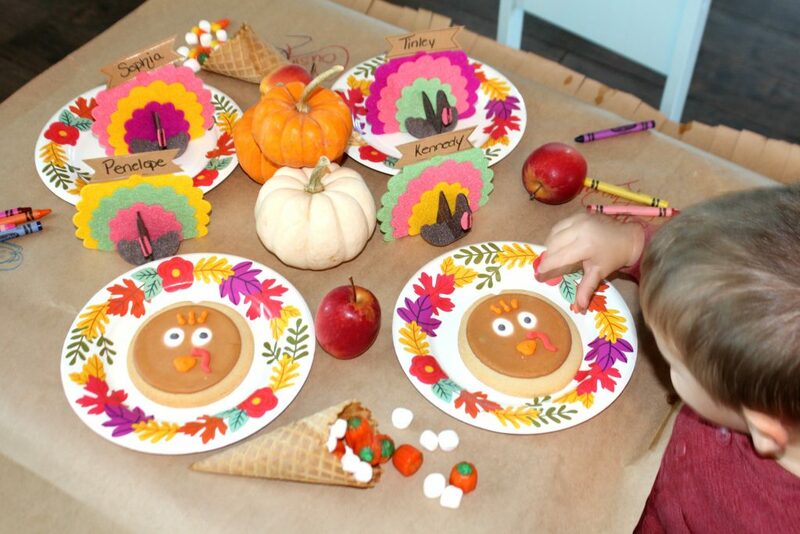 Create a turkey face on each cup using the stick-on eyes and marker for the break. Squirt ranch at the bottom of each cup and have the kids put in their favorite sliced veggies to create “feathers”. Veggie straws also work!